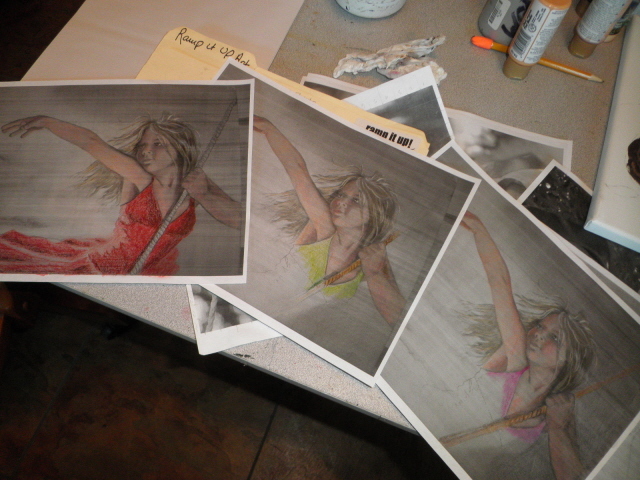 I thought you might like to see the thought process that I go through while going creating a painting. Of course you have to start from and Idea. A friend of mine at https://www.facebook.com/FroslandPhotography took this photo and gave me permission to make a painting from it. My intention was not to replicate the person but I loved the lines and the composition. I could imagine her on a totally gray background so all you saw was the color in the child. 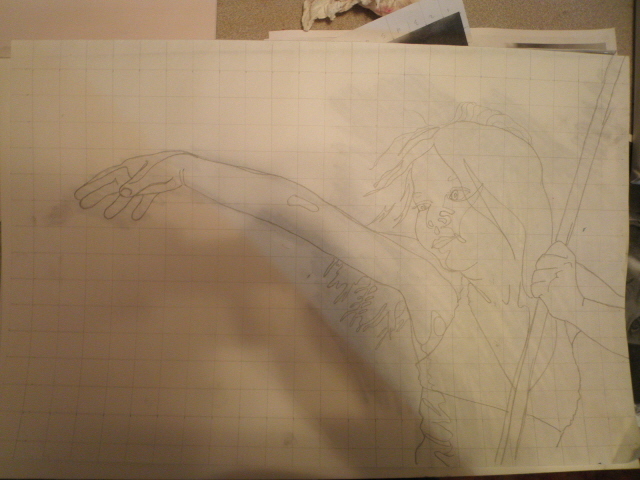 So I drew it up and did a basic outline on the canvas. I then covered the canvas with a gray wash. After the background area was covered, I misted it with water to make it blend and move. 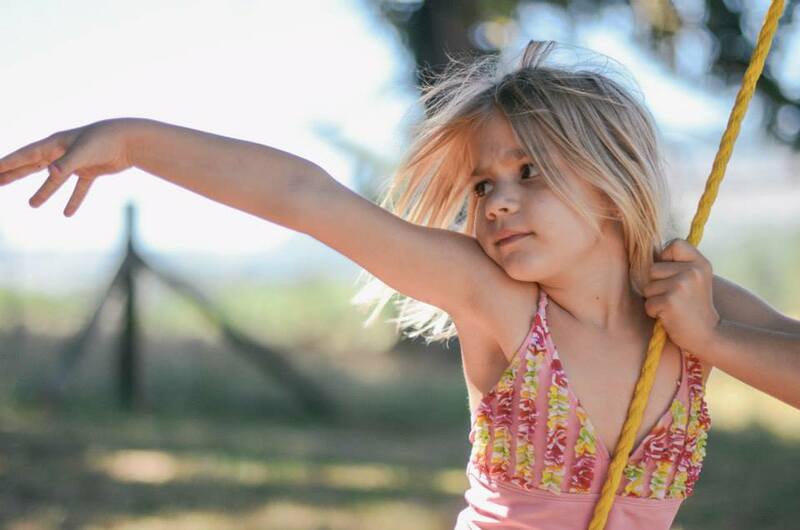 As the child is on a tree swing I really wanted to incorporate movement in the background. So I lifted the edge of the painting and let the paint move, run and drip and just wiped out the color in the sections where I wanted it to stay light. I fell in love with the background. I loved how it softens the edges of the skirt and added shading to the side of the chest. 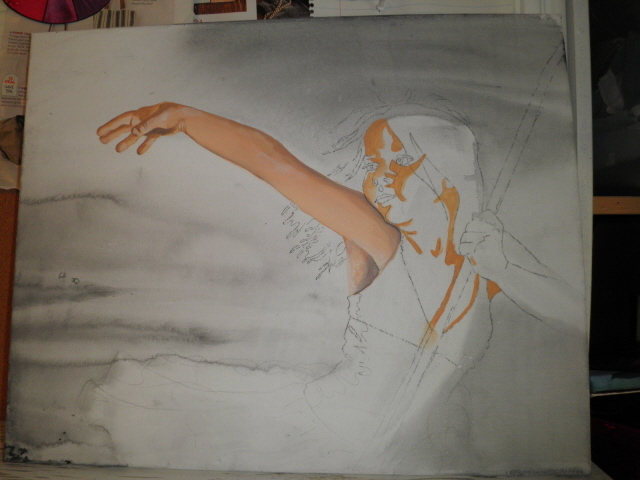 Then I block in the shadows and light of the skin tones in the arm and face. I knew right away that this one was going to be a favorite. 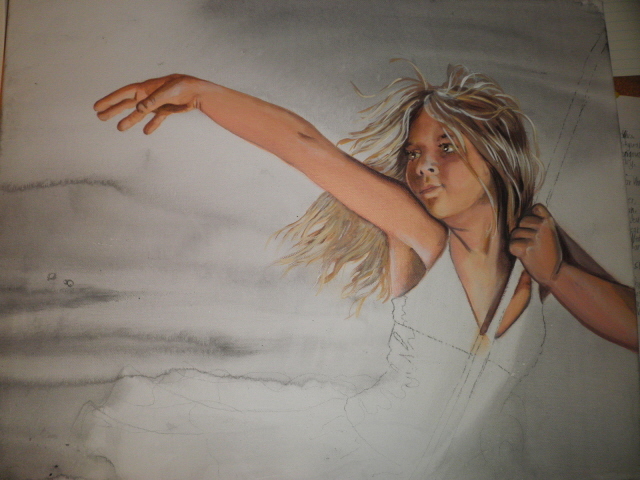 As I continued with adding detain to the skin tones I stared to wonder if I really even wanted to finish the dress or any other detail. I loved it just the way it was. 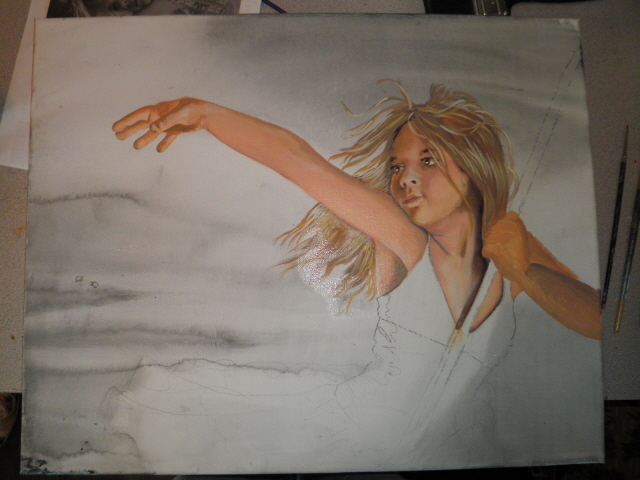 I also blocked in the hair and started to add some detail with high lights and deep dark browns. So now came a decision point. I loved the skin against the gray back. I love the softness of the shadow against the pencil work. I just wasn’t sure if I wanted to go any further with this or leave it with the unfinished look drawing all attention to the child’s face. So a good friend of mine, who is also an artist, encouraged me to take a picture of it, photo copy it several times and then color in with colored pencil the different Ideas I would like to try. That way I could see what works and what doesn’t. I love red and of course wanted to add it, but once I colored it into the painting, all I saw was the red dress. Not good! I then tried the Pink thinking it is lighter and may not draw as much attention. But this only left the skin tones looking washed out and dull. So I tried the green to compliment the skin tone and again the focus was back on the face and the beautiful light feeling of the painting. I continued to add more shadows and light and glaze in a few reds in the warm sunny spots on the skin and greens into the shadows. I also decided through this process to add just a suggestion of the rope by the hand so that the viewer would have the complete Idea but not be distracted by it. And I knew right where to stop! It was finished and I love it!